It’s not unusual for my dad to receive between five and ten fundraising appeals a day. He is a generous man and gives to many nonprofit causes, so his mailing address is on dozens and dozens of mailing lists. What’s surprising is that he reads every one of those letters. Sometimes Dad will read a letter simply to find out what it says. Sometimes he will complete a survey. Sometimes he will write a check. Compare his responses with that of his granddaughter, a millennial, who also is generous. She gives to her church via automatic withdrawal. She supports causes financially via social media. She volunteers in her community when her favorite organizations send her an email and direct her to their online sign up form. Two generous people in two generations: which will read and respond to your fundraising appeals? Both. 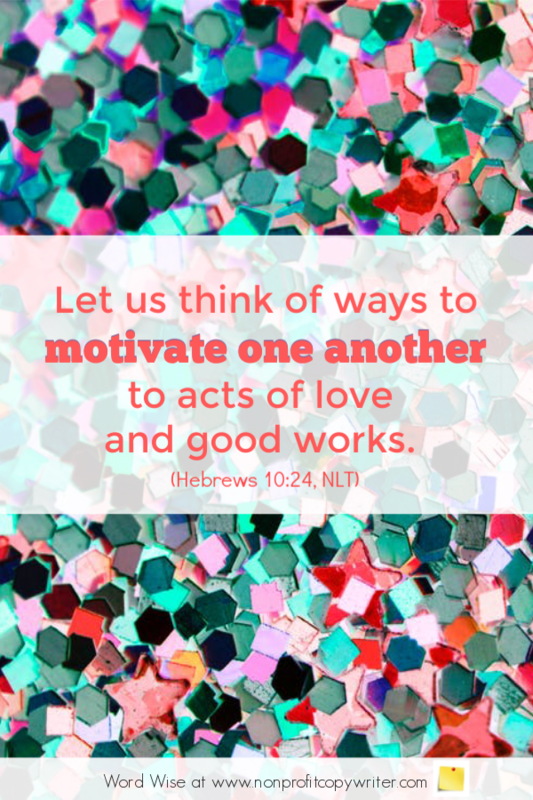 God tells us to think of ways to motivate one another to acts of love and good works (Hebrews 10:24, NLT). Print, automatic giving, online giving, social media: when I present a call to action in several different ways, I motivate different readers to respond in the way that works for them. Even the octogenarian who receives ten appeals a day in the mail. Offer readers a variety of ways they can respond. You find all different ways to motivate us. Let me be creative as I write. Show me different ways to offer my readers different ways to respond.